Diagram of geological time scale. Historical geology uses the principles and techniques of geology to work out the geological history of the Earth. It looks at the processes which change the Earth's surface and rocks under the surface. Geologists use stratigraphy and paleontology to find out the sequence of the events, and show the plants and animals which lived at different times in the past. They worked out the sequence of rock layers. Then the discovery of radioactivity and the invention of radiometric dating techniques gave a way to get the ages of the layers (strata). We now know the timing of important events that have happened during the history of Earth. The Earth is about 4.567 billion (4,567 million) years old. 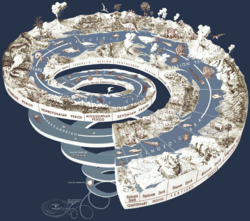 The geological or deep time of Earth's past has been organized into various units. Boundaries on the time scale are usually marked by major geological or palaeontological events, such as mass extinctions. For example, the boundary between the Cretaceous period and the Palaeogene period is defined by the Cretaceous–Tertiary extinction event. This marked the end of the dinosaurs and of many marine species. Prospecting for energy sources and valuable minerals depends on understanding the geological history of an area. Such knowledge can also help lessen the hazards of earthquakes and volcanoes. The largest defined unit of time is the supereon composed of Eons. Eons are divided into Eras, which are in turn divided into Periods, Epochs and Stages. At the same time paleontologists define a system of faunal stages, of varying lengths, based on the kinds of animal fossils found there. In many cases, such faunal stages have been adopted in building the geological nomenclature, though in general there are far more recognized faunal stages than defined geological time units. Geologists tend to talk in terms of Upper/Late, Lower/Early and Middle parts of periods and other units, such as "Upper Jurassic", and "Middle Cambrian". Upper, Middle, and Lower are terms applied to the rocks themselves, as in "Upper Jurassic sandstone," while Late, Middle, and Early are applied to time, as in "Early Jurassic deposition" or "fossils of Early Jurassic age." The adjectives are capitalized when the subdivision is formally recognized, and lower case when not; thus "early Miocene" but "Early Jurassic." Because geologic units occurring at the same time but from different parts of the world can often look different and contain different fossils, there are many examples where the same period was historically given different names in different locales. For example, in North America the Lower Cambrian is called the Waucoban series that is then subdivided into zones based on trilobites. The same timespan is split into Tommotian, Atdabanian and Botomian stages in East Asia and Siberia. A key aspect of the work of the International Commission on Stratigraphy is to reconcile this conflicting terminology and define universal horizons (time division) that can be used around the world. In North America, the Carboniferous is subdivided into Mississippian and Pennsylvanian sub-periods or epochs. Discoveries in the past quarter century have substantially changed the view of geologic and paleontologic events just before the Cambrian. The term Neoproterozoic is used now, but older writers might have used 'Ediacaran', 'Vendian', 'Varangian', 'Precambrian', 'Protocambrian', 'Eocambrian', or might have extended the Cambrian further back in time. Dates are slightly uncertain, and differences of a few percent between sources are common. This is because deposits suitable for radiometric dating seldom occur exactly at the places in the geologic column where we would most like to have them. Dates with an * are radiometrically determined based on internationally agreed GSSPs. Paleontologists often refer to faunal stages rather than geologic periods. The faunal stage nomenclature is quite complex. See http://flatpebble.nceas.ucsb.edu/public/harland.html for an excellent time ordered list of faunal stages. In common usage the Tertiary-Quaternary and Palaeogene-Neogene-Quaternary are treated as periods. The term 'age' (e.g. 'Neogene Age') is sometimes used instead of 'period'. The time shown in the "Years Ago" column is that of the start of the Epoch in the "Epoch" column. Historical geology Facts for Kids. Kiddle Encyclopedia.